The tour starts at the Historical Hollywood Cemetery just down the hill and around the corner from the main gate at 412 South Cherry Street. 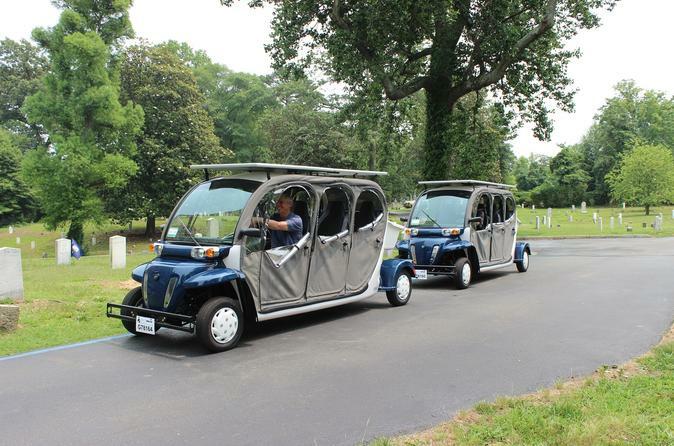 You will be met by there by our professional guide in one of our Low-Speed Electric Gem Cars. They will take you on an exciting ride throughout one of Richmond's major attractions. This incredible cemetery is the resting place of two United States Presidents, James Monroe's Tomb and John Tyler's Monument as well as 28 Confederate generals! Along the way you will see a 90-foot high granite pyramid that was built in 1869 as memorial to the more than 18,000 enlisted men of the Confederate Army buried in the cemetery and will also come across the site of Jefferson Davis who was the President of the Confederate States of America and buried beneath a life-sized statue. Then there is the The Iron Dog statue, which is one of the most well-known monuments in Hollywood Cemetery. It is a cast-iron Newfoundland dog and the statue stands guard over the grave of a little girl who died in 1862. Come and experience this amazing place with us on board one of our little electric cars with a fun and knowledgeable tour guide to show you around!